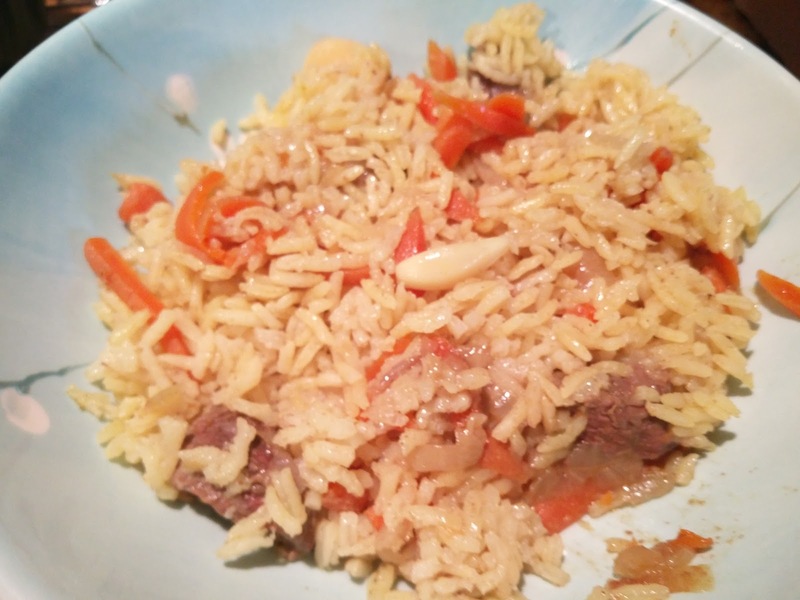 Plov is a traditional kazakh dish. Traditionally, it is made with lamb, but we used beef. We have also made it with chicken and it turns out quite good. We use our multi-cooker for this, but a dutch oven might be best. We use the multi-cooker and set it to "white rice" setting because it is super convenient - you throw all the ingredients together and it cooks itself! The rice to veggies to meat should be equally proportional - so 1 lb meat, 1 lb veggies (onions and carrots) and about 2 cups rice should provide good proportions. Other items that can be added into this dish are corn and raisins. 1. Set the multi-cooker to white rice. 2. Add oil, wait for it to heat up. Add in chopped onions and carrots and all spices and salt. When the veggies are softened, then add the meat until browned. 3. Put rice on top of the veggies. DO NOT STIR. 4. Poke whole cloves of garlic in a circle on top of the rice. 5. Add chicken stock and water until liquid is a little bit above the rice. 6. Close multi-cooker until cooked. This is a good one dish, deliciously spiced meal that is not too heavy. Makes great left overs too! He was too busy learning how to write letters to be concerned with matters of food tonight.